Two popular stopovers for visitors to Cote d’Azur are St.-Paul-de-Vence and Mougins, fortified hilltop villages, not far from Nice and Cannes that became art colonies and temporary homes for famous writers and artists during the 1920s and 1930s. Besides being great places for lunch they offer visitors an interesting combination of medieval times; sitting where the likes of Pablo Picasso, Marc Chagall, Scott Fitzgerald, Yves Montand and countless other actors and actresses once sat – and are still sitting each May when the Cannes film festival is in action; and endless places to look at or buy local art. St.-Paul-de-Vence is about six miles northwest of Nice and Mougins is a couple of miles north of Cannes. 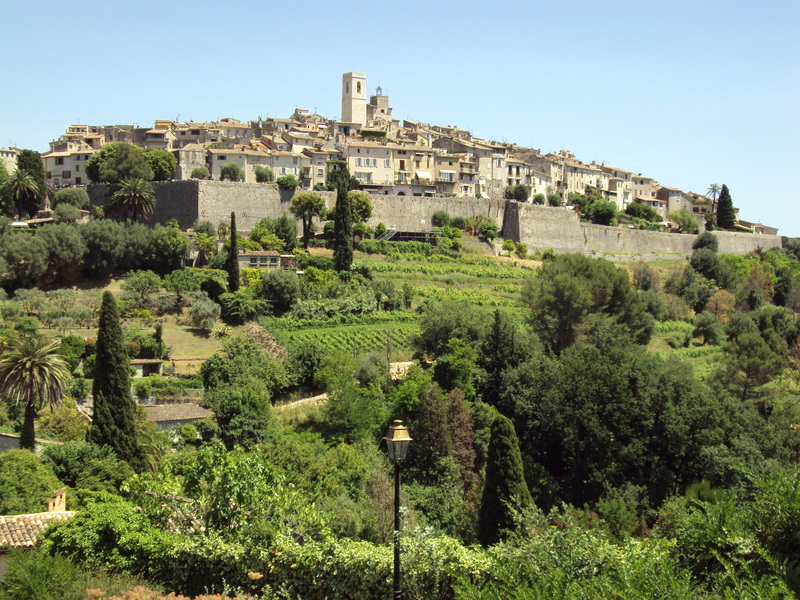 St.-Paul-de-Vence is of particular interest in that has more of a historic feel. It is not on a high mountain top like Peillon or Saorge, but it is still a walled hilltop city that has not lost its medieval appearance. It was a bishopric in Roman times; has an 11th century church; ramparts that were built starting in the 13th century; and few medieval cities of its size are so well preserved. Its 11th century church, Collegiale-de-la-Conversion, is one of three Cote d’Azur gothic churches that give a real feel of medieval times – Cathedrale St.-Leonce in Frejus and the Basilique-de-Mary Magdalene in St.-Maximin being the others. In more recent times, St.-Paul-de-Vence was closely associated with a Russian born painter, Marc Chagall. He came to France in 1923, but initially most of his time spent in Cote d’Azur was on temporary visits. It was not until 1950 that he purchased a home in St.-Paul-de-Vence and became a permanent resident. Long before Chagall came to stay, D.H. Lawrence had moved to St.-Paul-de-Vence from Bandol in hopes of regaining his health. Unfortunately, he would die soon after the move and was buried there in 1930. Mougins has a history similar to that of St.-Paul-de-Vence in that it dates back to Roman times; had a church and ramparts built in medieval times; and was a home to famous artists between the wars; but it is more a product of its recent artistic past than the olden days. This, though, does not diminish its visitor appeal as it is a great place to just wander around and have lunch. Its artistic life was dominated by Picasso who first visited the village in 1936. Like Chagall in St.-Paul-de-Vence, he initially was a part-time visitor and did not become a permanent Cote d’Azur resident until he moved to Mougins in 1961. Eating, though, is on the minds of most visitors to these two villages and with good reason. They have some of Cote d’Azur’s best restaurants, and the excellent food is made to taste even better by the pleasant setting and, in some case, countryside view. When it comes to eating, Mougins may be a step ahead of St.-Paul-de-Vence and helped by its proximity to Cannes that has made it a popular eating place for the stars in May when the film festival is in full swing, but you cannot go wrong at either place. Leading the way in Mougins are the two restaurants of chef, Denis Fettison. 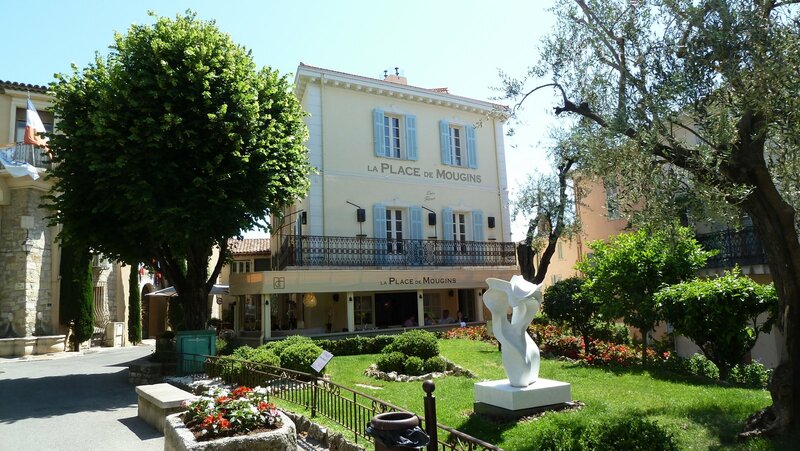 La Place de Mougins tops most of the best restaurant lists for the village, and a recent visit with friends for lunch has me as one its many fans. The fish, beef and pork specials were superb, but even better were the added treats that kept showing up as our two hour sit moved along. His other restaurant, L’Amandier, was not open that day for lunch, but with its setting in stone house with a terrace on the top floor that overlooks the entire region, it has an added appeal. They also are only two of the six or seven restaurants in town that normally have Michelin ratings. The reviews of the longtime top-rated Le Moulin de Mougins, however, suggest it is not what it used to be. St.-Paul-de-Vence has just two highly rated restaurants, but it is not lacking for good places to eat. The most popular is Le Tilleul, one of the two Michelin rated restaurants in town with its outdoor seating under a tree that provides ample shade. It has a fun, touristy appeal and also has good food. When eating there we stayed fairly standard with entrecote and lotte (monkfish), but a local cassoulet is quite popular. 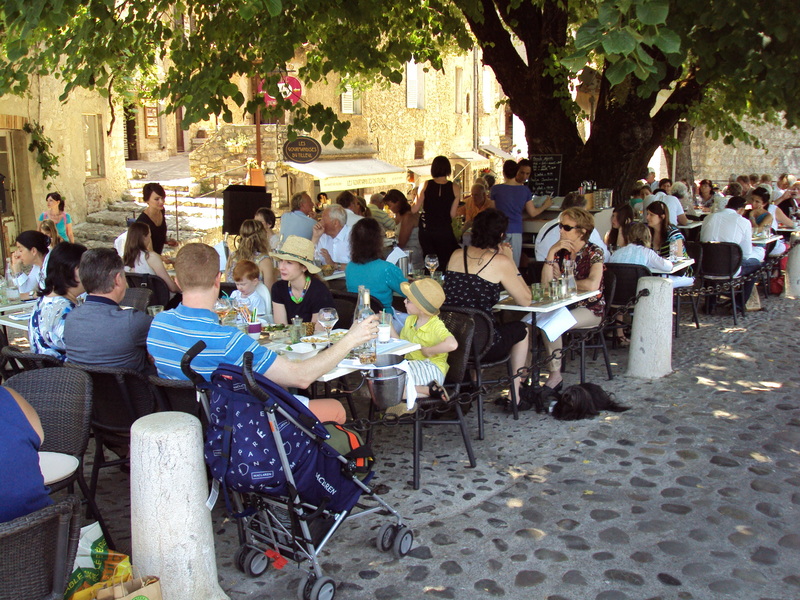 The Artiste is a local favorite, and if you are looking or ambience plus food, this is the place in St.-Paul-de-Vence. This blog includes excerpts from my book, A Travelers History of Cote d’Azur. This entry was posted in Mougins, St.-Paul-de-Vence and tagged Mougins, St.-Paul-de Vence. Bookmark the permalink.